If you've received a DVD Profiler Registration Voucher like the one shown at left, you're in for a treat. DVD Profiler is the premiere tool for cataloging and organizing DVD collections of all sizes! 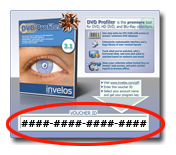 To get started, enter the Voucher ID from the bottom of your DVD Profiler Registration Voucher below. I want to purchase a voucher to give.